In order to attend a PECB Certified Training Course, go to www.pecb.com and log in at your PECB account. 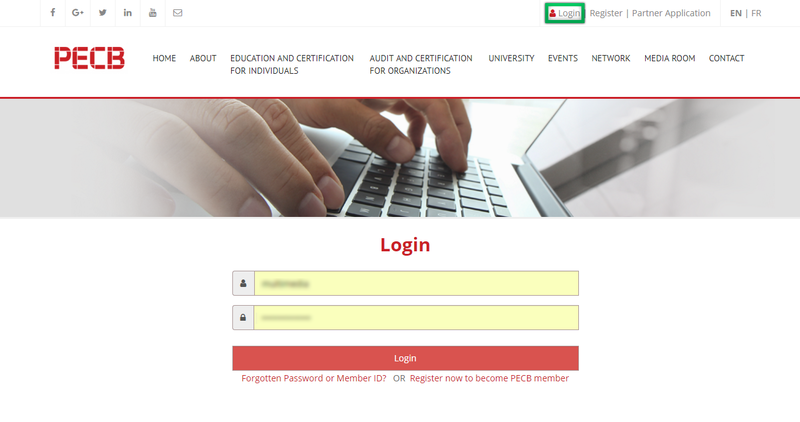 If you do not have a PECB account, you can click register to create an account. After registering, please go to the Events page to enroll for the training course you are interested to attend. After identifying the course, please click the Enroll Now link to be enrolled for the course. 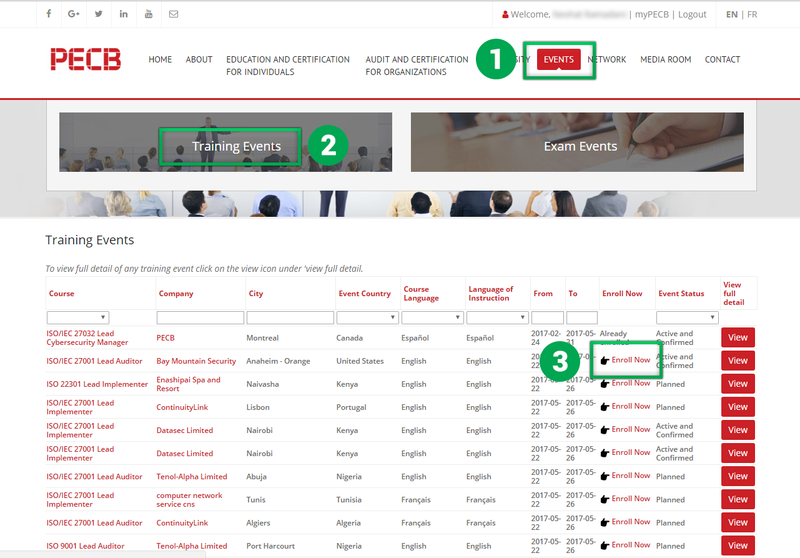 You will receive an email confirmation from the reseller/trainer, and the course material will be assigned at your PECB account on the training day. 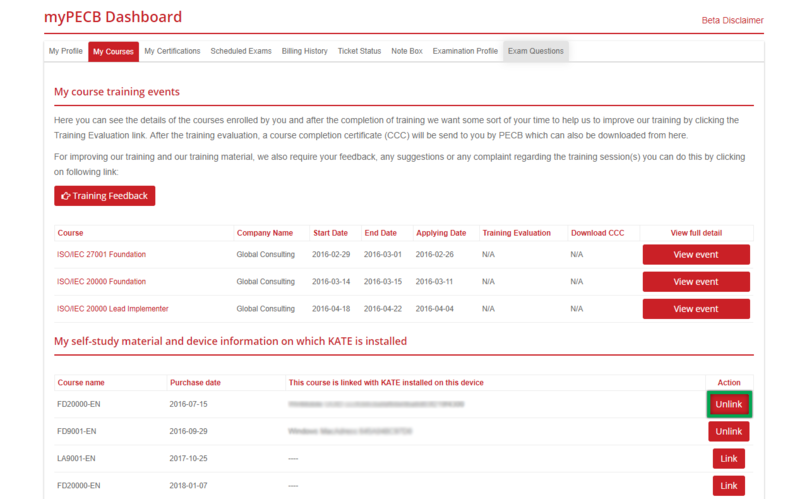 If you do not see the training course in your PECB account, please ask the Trainer to assign the course to you. Please note: If you have ordered a Self-study material to study on your own, the course material should be assigned to you earlier. 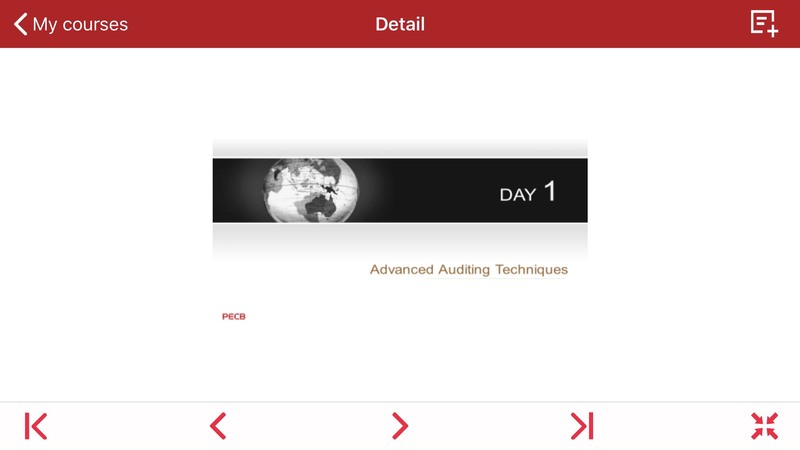 If you don’t see the materials assigned in your PECB account, please contact the Reseller to assign the course material to your account. On the training day, please download the KATE version compatible to your device. 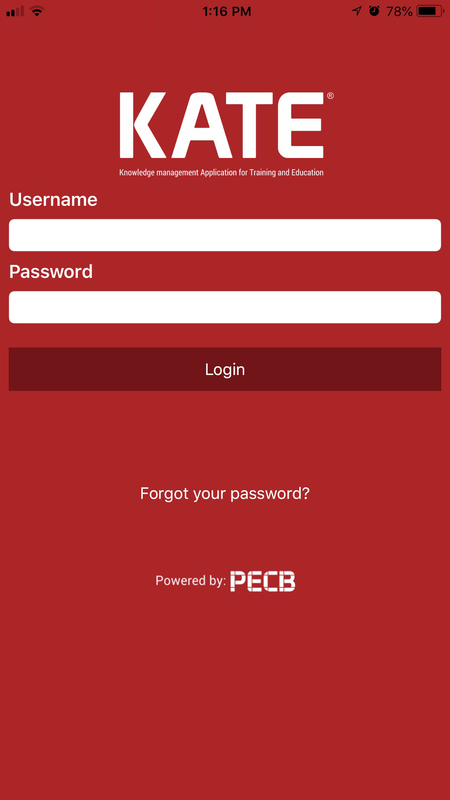 After the installation, provide the credentials of your PECB account to login. After you log in, all the courses assigned to your account will be visible. You can access a specific course by clicking the Link course button. 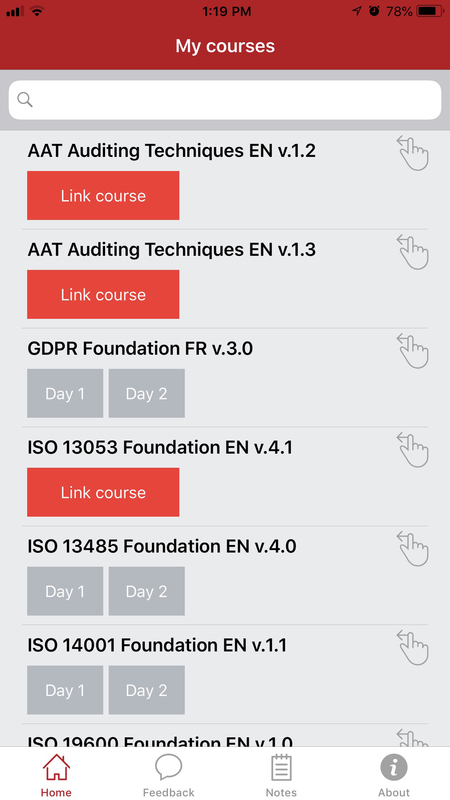 If the desired course is linked to another device, and you need to link the course with your current device, click the Link course button and the course will be automatically unlinked from the previous device and get linked to your current device. Please note: A course can only be linked with one device at a time. After clicking the Link course button, you will be provided with the training materials which you can view by clicking a specific course day. In the homepage, please swipe left, and click on submenu at the top right corner, in order to add Feedback, Personal Notes, view Course Documents (such as Case Study, Exercises, or download the course materials locally at your device in PDF format). You will be able to view the slides, and also the notes relevant to a specific slide at the bottom section of KATE. You can navigate through slides using the </> arrows, and zoom in or zoom out through finger control. To view a slide in full-screen mode, click the full-screen icon located at the lower right corner of the screen. Note that viewing a slide in full-screen mode will remove the notes, and you will see only the slides. You will have access to all the notes you have saved using the Personal Notes option available on the main menu. All notes are associated with a specific slide, and you can open the slide by clicking the note. 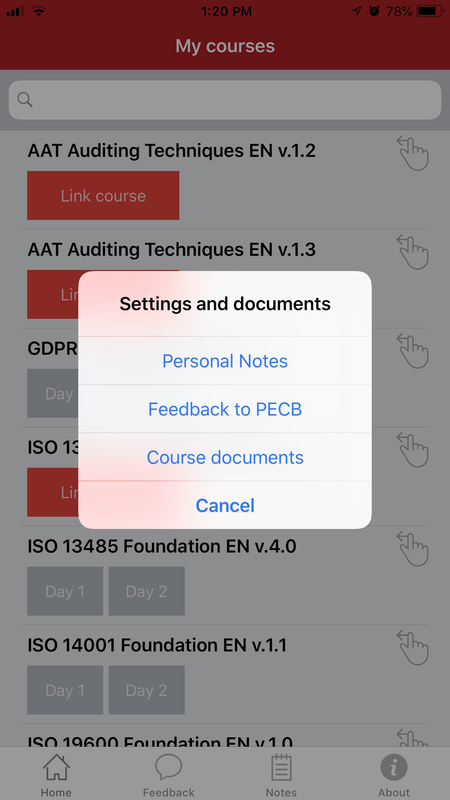 You will also have access to all the feedback messages you have sent to PECB under the Feedback to PECB option. You can click on a feedback message to open the slide for which the feedback was submitted. 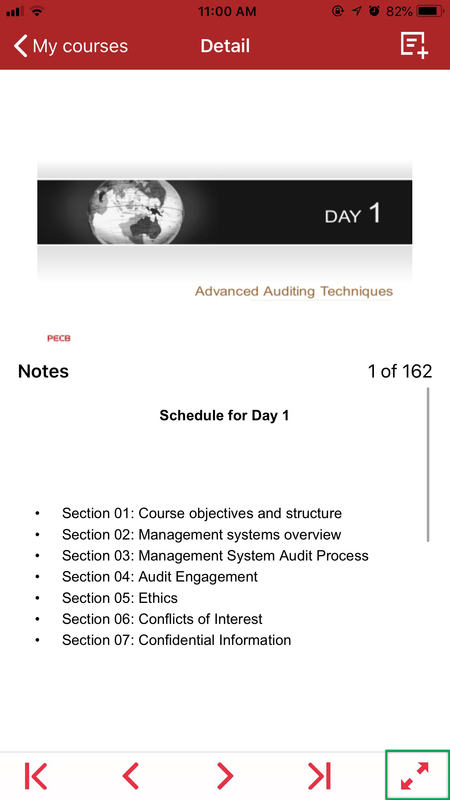 To download the course materials locally, click the Course documents option to open the list of files available. 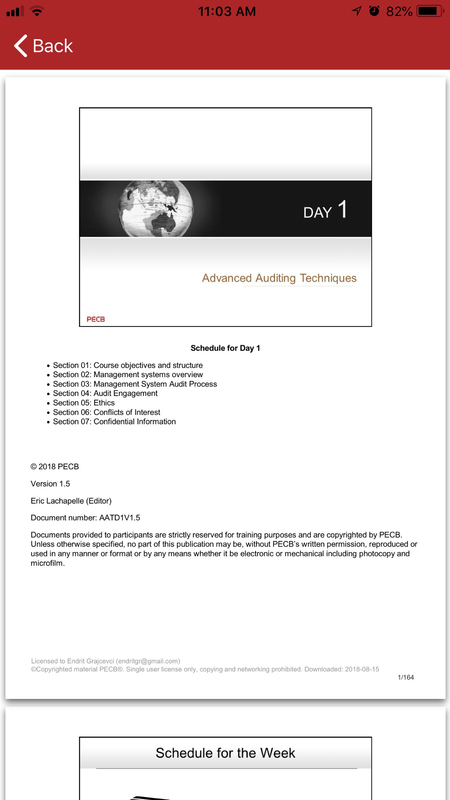 Documents are separated into Case Study & Exercises, and Slides in PDF categories. 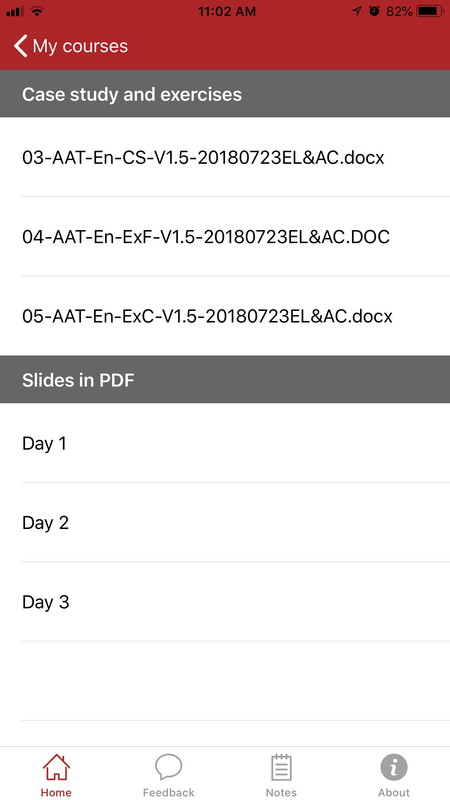 After you click on a document (for example Day 1), the file will be downloaded and saved locally so you can access and print it. When you decide not to use a device for accessing PECB course materials, please go to the About page, and click the Unlink this account button. The list of courses you have available is also available within your PECB account under the “My Courses” tab. Using this tab, you can also switch the course materials access from one device to another. The access can be managed using the Link/Unlink buttons which will open a list of MAC Addresses retrieved from the devices you have installed and used KATE. Above you read more detailed instructions about each step. However, we want to summarize a few very important steps that should not be missed. Once the course is assigned to you, it will appear on your myPECB dashboard. 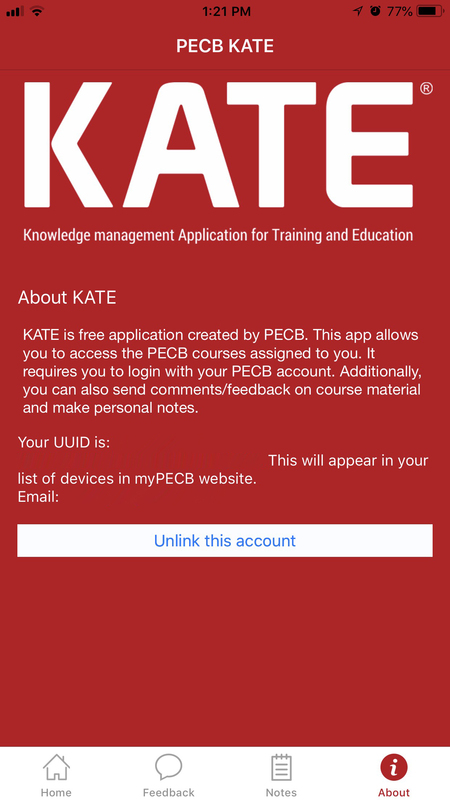 You can download KATE from at https://pecb.com/kate, install it on your device and login to the device with your PECB account. One course can only be linked with one device. If you want to open the course using a different device, click the Link course button using the secondary device. If you have ordered a Self-study material to study on your own, the course material should be assigned to you earlier. If you do not see the materials assigned to your PECB account, please contact the Trainer or Reseller.